It can not possibly be March! We are enjoying see all our "snow birds" here that have escaped the blowing snow. We enjoy especially seeing all the great projects you bring to share from your northern quilt shops. Thanks - they are great!! We had such a great time Saturday at our first Sample Sale and quilt give-a-way. It is amazing to see all we have collected during our 5 years. There is so much more for us to share. We do have a few more samples to sell. They are in the classroom and our Batik room. The give-a-way was a great success. Congrats to Susie who picked out bright Flamingo Run quilt. She was the only winner in attendance so she picked first. We have contacted the other 4 and many have rushed in to get their choices. The winners are Susie S., Judy K., Rochelle M., Jackie K. and Paula G. Here are some pictures of the happy winners. It is nice to have a little calmer week at the JaM Patch. Our classroom is busy today with Crazy Quilting. Joey is teaching an on-going class and they are looking so good. Wednesday Kim is teaching the "Woven Table Runner". This is an amazing technique and they are always so beautiful when complete. Friday the "Whimsical Garden" group is meeting at 9am. We do get some work done among all the giggles. That leaves Thursday, March 3rd, as a UFO day. For just $10 you can sit and stitch with your friends and use our classroom to "spread" out. The room is available 10 - 3:30. Spring is in the air- our flowers are bloomin! That must mean All FLORALs are on SALE this week. Get 25% off a one yard cut or larger, excluding batiks and new Christmas. This sale is valid through Monday, March 7th. 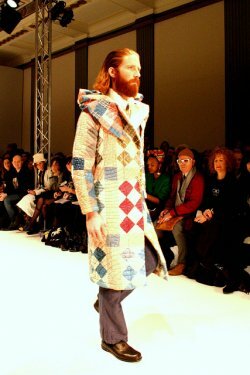 Quilting has hit the big time...the London runway for Fashion Week has quilted garments on it. Thought you would enjoy this picture and see if anyone in your house would like to be walking around in this.